"Turn right one half mile ahead." The box stuck to her windshield was telling her what to do. Every time the woman's electronic voice squawked, Rebecca glanced at the colorful map the device displayed, but she trusted her view of the real road better. The display showed little streets and cross streets, with a bright red arrow snaking through them so she would know exactly where to go. Ahead was the turn she had to make to get to Steve's new apartment. He’d found the place on his own. "For the both of us," he told her, but that had been his plan, not hers. He'd loaded his new address, "our new address" he called it, into the navigation device and gave it to her as an anniversary gift. He got it for her so she wouldn't get lost, so she'd come straight to him. He told her that sometimes she was aimless. "Come by Saturday. Between ten and ten-thirty," he said, handing her the heavy, wrapped box and heaving one of his toothy smiles her way. "Wear that new top I got you." "Turn right now," said the box. Rebecca waited for the light to change, but when it did, she continued without turning. Steve didn't like Cindy. He told Rebecca she should hang out less with Cindy and more with him. He pretty much didn't like any of her friends. They only needed each other, he said. "Turn right on 31st Street." Rebecca looked briefly at the screen then signaled to change lanes. She swung around a slow truck but missed 31st Street before she could get back in the right lane. Already it was a quarter to eleven. Cindy laughed when Rebecca told her about the navigation device. "I used one of those on my trip to Colorado. If I did what it told me, I'd have driven over a cliff!" "Proceed three blocks. Turn right on 23rd Street." Rebecca wasn't familiar with this part of town, though she thought that Steve may have taken her to a few bars nearby. She always let him pick because that seemed important to him. Tall buildings hemmed in on each side. She could barely see the sky. When 23rd Street came, she went through the intersection without turning. "You missed your turn. Recalculating." Around her, people went about their lives. Saturday midmorning lives that looked busy and purposeful. Steve told her she shouldn't waste her time at college. She was as smart as she needed to be. He would take care of her. She didn't have to worry about a thing. "Turn right on 19th Street." When she got there, the woman's voice nudged her. "Turn right now." "You missed your turn again, Rebecca." A pause. "Recalculating." Steve would be angry that she was late, but then he'd calm down and say they would just have a late lunch. He'd probably found some place nearby where he already knew what was on the menu, and he'd tell her exactly what she should order. "Turn right on 15th Street. We have to backtrack a long way." The left lane was closed at 15th Street, so the traffic was congested. Rebecca stayed in the right lane and let a half dozen cars merge in ahead of her before the man behind her leaned on his horn for her to move. She let one more car in before easing forward. "You missed 15th Street. Steve will be angry. Recalculating." Rebecca looked at the display. The grid of crisscross streets and the red arrow were now approaching a blue band at the top of the small screen. "Turn right at 11th Street," the box said, but Rebecca didn't. "You'll only make Steve more angry." Rebecca drove on. The blue band was taking up more space at the top of the display. "Why do you hate Steve?" But Rebecca didn't answer. She just drove. "Rebecca, you're making a mistake." Rebecca didn't think she was. "Listen, I'll calculate a route so you can turn around on the other side of the bridge." Soon they were at the very edge of the blue band and Rebecca rolled down her window. "Rebecca, why can't you and I be friends? Don't be foolish now." When the blue band filled the small display screen, Rebecca removed the device from the windshield and continued driving. There were so many roads to choose once Steve's instructions were at the bottom of the river. Paul Lamb hails from Kansas City, but he retreats to the Missouri Ozarks whenever he can steal the chance. He's currently at work on a novel about art versus mundane existence and the strange demands the can result when they intersect. His fiction has appeared in the Platte Valley Review, Present Magazine, Danse Macabre, the Beacons of Tomorrow second anthology, and Wanderings. He rarely strays far from his laptop. 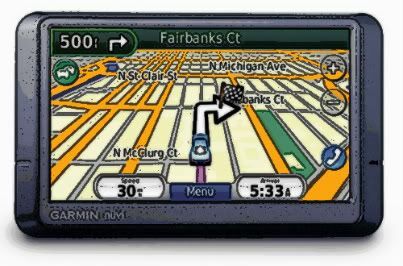 I love reading maps, and I have a pretty good sense of direction, so when I tried using a GPS navigation system in my car, I felt offended that some electronic voice was telling me what to do. Where's the adventure in that. It didn't take much of a leap of imagination to come up with the idea of these devices having personalities, very controlling personalities. Thus my story. I loved it. Very witty.